In the past weeks, SEB students have been able to test almost 30 new databases. Trials were organized by Central Economics Library in cooperation with providers of economics and business databases. We are more than happy for all feedbacks you’ve provided so far. Now a trial is over and we would like to invite you to share your opinion on existing databases and opinion on new ones via survey. 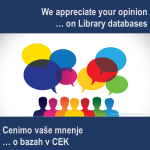 The analysis of the survey will be presented to the Research Committee and will help them make a proper decision for the 2020 databases subscriptions.